New York City abodes often have small kitchens, but with these kitchen remodel ideas you can still make a huge statement in the home. 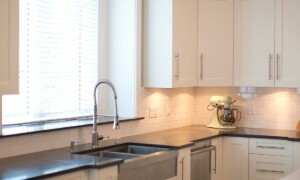 From opening walls to updating cabinetry, there are many ways to achieve a new kitchen look with kitchen remodel ideas. Many small and large NYC apartments have small-sized galley kitchens. There are ways to achieve more kitchen space without actually expanding into another area. 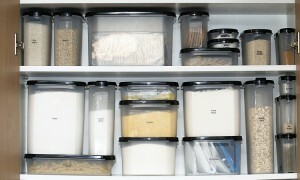 Add shelving or cabinets above windows and doors to provide more storage. Hang a rack from the ceiling to store pots and pans, and it will make an artistic statement as well. And by breaking one wall down, you can add a pass-thru and accommodate counter seating on the other side, opening up a small kitchen into the larger space. Excellent lighting will brighten up a smaller space. Place recessed lighting in the ceiling to fix the long, dark tunnel effect that many galley kitchens take on. 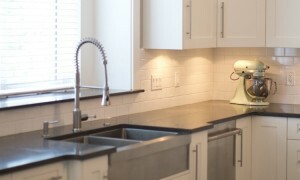 Accent pendant lights can be hung over the sink and open counter areas. Allow natural light to come in by keeping window treatments simple. Open up a kitchen by getting rid of dark cabinetry. This can be done by either painting it a lighter color or replacing with a light wood. New upper cabinetry should climb to ceiling height in order to give optimal storage space. White is a great choice to keep a kitchen looking clean and bright. Add contrasting colors or neutrals in the backsplash and countertop. Yes you can get rid of that ugly old laminate look with paint. Before painting, prep by removing hardware and scrubbing cabinetry. In order to paint laminate, you must apply a special primer first. Check with a specialty paint store in order to buy the right primer. After priming, you can paint the cabinets in your color of choice to give them a fresh new look. Finish up with new hardware and a new countertop and backsplash. Even a smaller kitchen can enjoy a bit of island joy. Instead of the island being central, have it perpendicular to the wall as a divider to a breakfast nook. For very limited space, create a drop-leaf island that can be lifted up from the stored position for extra counter space. Employ an island that travels on casters so that it can be stored away when not in use. With a bit of magic you can transform found decor into new kitchen cabinetry. Turn a dresser into an island with paint, new drawer pulls, and a butcher block or granite counter. An armoire can be made new again by turning it into a kitchen pantry. Be really adventurous by collecting a number of pieces that you can join together and paint in a single color. Finish connecting the new decor with new knobs, pulls, and countertops to tie the look together. Add shelving above in place of upper cabinets to create an entire new kitchen. Enjoy being creative with kitchen remodel ideas that will certainly update your New York City abode. Visitors will definitely be envious of your beautiful new decor.